Go ahead, swig that sweet cereal milk. The products in this post were updated in October 2017. 1. 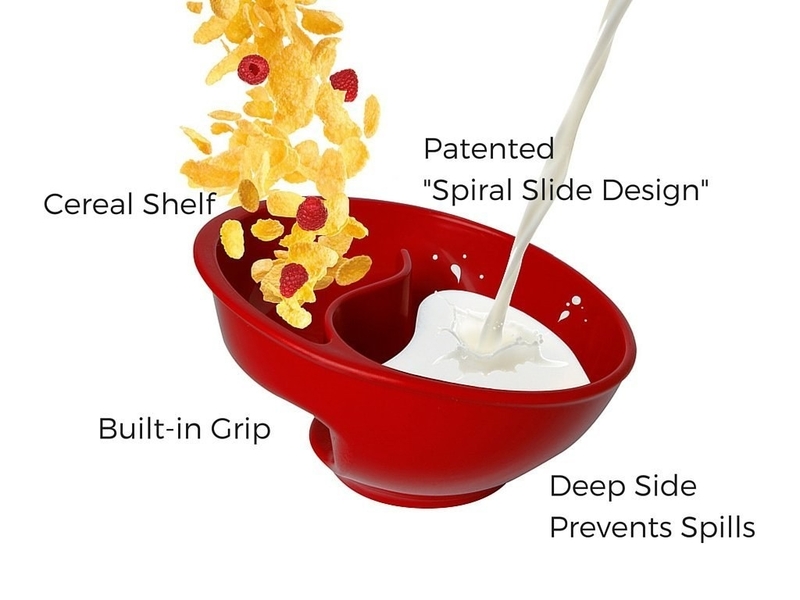 Keep your meal the right ratio of cereal-to-milk with this compartmentalized bowl that lets you scoot the perfect amount of cereal into milk for optimal saturation. 2. Host a cheery Cheerio in your kitchen with this fun print. Get the instant download from Call Me Artsy on Etsy for $5. 3. Make it a.m. fresh in your car with a Froot Loops air freshener. Get it from Hey Yolo on Etsy for $4.95. 4. Whip up some of Milk Bar Bakery's famous cornflake-chocolate-chip-mashmallow cookies with this ~official~ cookie mix. Or just order the cookies premade from Milk Bar Bakery for $14.75. 5. And transform regular milk into the bakery's beloved drink with this cereal milk mix to wash down those cookies. Just add the mix to 8 cups of plain milk. Get it from Milk Bar Bakery for $5.25. 6. Mark your page with cute magnetic bookmarks while you break from reading for a snack. Get it from Fun Usual Suspects on Etsy for $6. 7. Light your cereal altar with a convincing cereal-bowl candle. Maybe don't put this in the kitchen. Get it from Candlelit Desserts on Etsy for $22. 8. Scribble down a cereal log in a Raisin Bran notebook. 9. Take this travel mug with you for washing down all the sugary breakfast goodness. Get it from Fabian Gonzalez on Society6 for $18.74. 10. Keep that bargain-box cereal from going stale in a dispenser that'll look nice on a kitchen countertop. Get it from Amazon for $35.84. Available in a single dispenser and in four colors. 11. Carry this sad pouch as a warning to all clumsy eaters. Get it from Becky Gibson on Society6 for $11.99. 12. 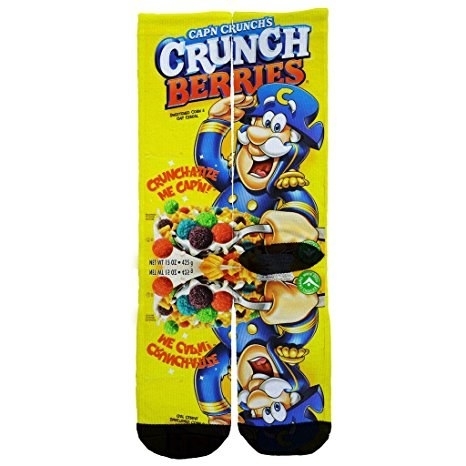 Pick your crunchy poison with a pair of Crunch Berries or Cap'n Crunch socks. 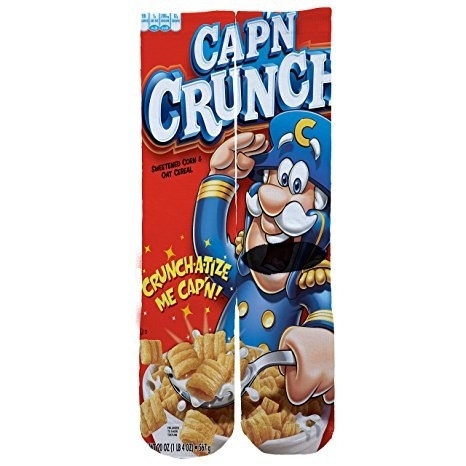 Get them from Amazon for $19.99 (Crunch Berries, Cap'n Crunch). 13. Pay homage to the greatest fictional cereal lover of all time with this Seinfeld apartment print, complete with an ample view of his cereal shelf. Get it from Beautiful Peace on Etsy for $14.52. 14. Add a sweet dusting to a movie snack with this cereal-and-milk popcorn seasoning. Get it from Allspice Emporium on Etsy for $5+. 15. Wear a graphic tee that shows what the lyrics to that song are really about. Get it from Crazy Awesome Tees on Etsy for $9.99+. Available in sizes S–5XL, four styles. 16. 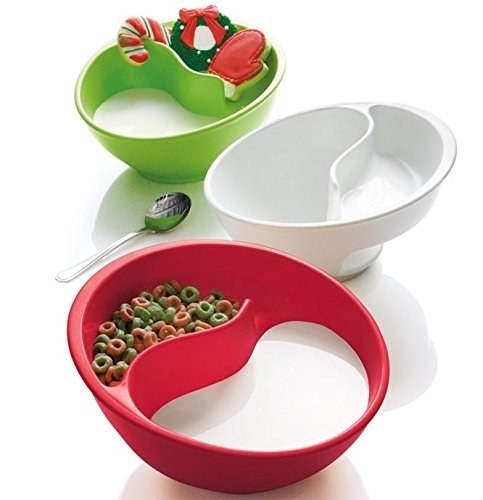 Eat out of a cereal killer bowl that takes the dad joke to Dexter levels. Get it from Dab-A-Dos on Etsy for $25. 17. Wear your breakfast love on your sleeve with a legendary trio. Get it from hopesick on Etsy for $18. 18. Keep some Cornflakes with you at all times with this adorable necklace. Get it from Zoozim on Etsy for $17+. Also available in Cheerios, Fruit Loops, Cocoa Puffs. 19. Participate in morning recreational activities by scoring points with this basketball hoop mug. Get it from Uncommon Goods or Amazon for $24. 20. Testify to the nourishment of cereal with this cute pin. Get it from Sweet Grenadine Shop on Etsy for $8.30. 21. Wear this dad-joke tank when you're killin' it in the kitchen. Get it from Fat Cat Tees on Etsy for $16.95. Available in unisex, women's sizes S–2X, in 11 colors. 22. Think about your fave while you soak in the bath with these bath bombs made out of ACTUAL FROOT LOOPS that'll turn your bath into a cereal bowl of your own filth. Get them from La Bonita Petra on Etsy for $3+.